It's a good month for South African Metal with no less that two releases worth checking out. With most Metal bands usually concentrated in the Western Cape and Gauteng area, it’s always great to get another flavour emerge from a less prominent part of the country. Case in point – Chromium, hailing from the friendly city Port Elizabeth (but relocating to the more bustling Johannesburg area). 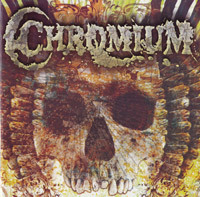 But there’s nothing friendly about Chromium’s brand of Metal music, even though its relentless attack and screaming vocals (on this, their third studio effort) leaves space for melody and often pulls back for (equally passionate but) harmonic vocals. As I have experienced myself, when you play Metal (of whatever variant) in South Africa, sitting and waiting for that record deal to slide under your door will result in a long wait. Going the DIY route will save you many headaches and help in propelling you forward as opposed to stagnating or giving up. Without the help of a record label, and taking the reigns when it comes to both engineering and producing, frontman Jared Gunston has done a good job of capturing the band’s energy and tight execution. Set to please listeners with a keen ear for quality, the songs are well put together and have a broad appeal, with Metal variants from Thrash to Metalcore.